The "Flight into Egypt" was a popular theme during the Counter - Reformation period and as can be seen in Claude's print, usually featured the Virgin and Christ Child on a donkey accompanied by Joseph and two guardian angels. Although Claude only made this one etched version of the "Flight," he returned to the theme many times in a number of later paintings and drawings dating between 1641 and 1663. Although no painting by Claude exists which relates to the particular design and details of the print, there is a drawing of the theme of the "Flight," which appears to date from the mid - thirties and which also has a similar grouping of figures and the same asymmetrical layout to the landscape, but in reverse. 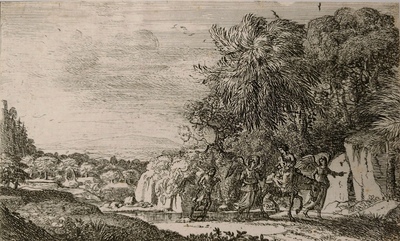 Claude's etching The Flight into Egypt is notable for its rich plate and the delicate dry point lines used to indicate the distant mountain rendered indistinct by the atmospheric perspective.